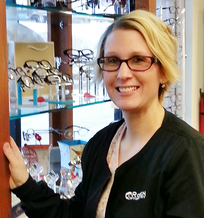 Vicki joined us as an experienced Optician and we were thrilled to have her lab experience, she has been a big help in our finishing lab. She has developed skills as a technician and even assists with insurance. Vicki is able to help out wherever there is a need and is very service oriented. Vicki is also athletic. We keep her very busy running around the office and she also ran a half marathon.